We are fortunate to have a unique opportunity to create a truly sustainable campus community from the ground up on a 102 acre site just outside of the township of Same. Although the development sector has embraced green thinking in recent years, opportunities to create educational institutions where sustainability is practiced at every level - outside the classroom as well as within - are as rare in East Africa as they are in the rest of the world. We aim to make the Same Polytechnic College campus a model of environmentally friendly development that will educate through its very design and operations, helping to prepare graduates, faculty, and regional partners for the energy and resource challenges confronting the regional and global community. Working in collaboration with the Tanzanian government, California Polytechnic State University, San Luis Obispo, and international design firm Arup, we have developed a master plan for the campus. This process provided an opportunity for us to further develop the goals and desired outcomes for the college and articulate a clear vision for the future. The master plan addresses the rationale for the development of the project; lays out goals for the campus site and anticipated program; and provides projected facility needs, planning principles, and design goals for the buildings and supporting infrastructure needed to support the projected enrollment of 1,200 students. This will be used to support future decision-making by identifying the physical resources that will be needed to further the mission and goals of the college and provide a framework to guide facilities and resources decisions. This is particularly important in the case of a new campus in a remote area of a developing country, where the significant amount of time, expertise, and capital needed to establish and grow this institution make judicious management all the more critical. The campus master plan addresses sustainability in areas including carbon emissions, energy, water, waste, materials, building and infrastructure life-cycle performance, transportation, and landscape. Demonstrating that carbon-positive operations can be achieved at the building, campus, and community scale has been a key goal throughout the process. We intend for the college to serve as a model for integrating planning, architecture, and infrastructure to create a net zero carbon footprint for a large development in an underdeveloped region. We define sustainability as the ability to minimize environmental impact, capital requirements, and operational costs while maximizing social and cultural utility. The master plan aims to align with sustainability best practices, including aggressive carbon targets: carbon neutrality at a minimum, and carbon positive operation as a goal. Controlling carbon output is particularly important in the Tanzanian context. Carbon emissions in Tanzania are currently relatively low but the country’s economy and population are growing, and with that will come increasing demand on natural resources and energy consumption, both of which represent primary sources of carbon emissions in the country and the wider region. But the low level of current emissions means there is an opportunity for Tanzania and the entire East African region to implement sustainable practices and technologies in development from the start as opposed to already developed countries which are currently trying to replace unsustainable infrastructure and practices. Achieving carbon positive operations therefore offers a means by which the campus can contribute to this opportunity by serving as a model for the level of sustainable development achievable in the region. housing designed to help attract high-quality staff. New colleges and similar developments in rural East Africa are sometimes located away from the nearest town, which can discourage residents on both sides from accessing shared amenities and services, especially in a region where residents have limited access to transportation. For this reason — and with the recognition that ventures such as this need the support of their local communities — the District of Same has been highly receptive to the idea of having the town and college located immediately adjacent to one another, with the campus becoming a vital part of the local community and vice versa. To this end, the master plan takes into account the need to provide a new home for local events and offer public amenities such as a library, community hall, and athletic fields. In addition, its educational programs will give learning opportunities to residents of all ages. The Same Polytechnic College will occupy a spectacular site at the edge of the town, bordering a forest preserve. The ecological, cultural, and social values currently associated with this site will be protected through the layout, configuration, and treatment of the campus site and facilities. Consistent with the goal of sustainability and carbon positive operations, the campus will retain its current ecological character to the greatest degree possible, and will feature extensive use of native vegetation (which will require little water and provide a welcoming habitat for local species). The Same Polytechnic College site offers tremendous opportunities to shape a living laboratory for learning, both for the students and for people and institutions concerned with environmentally responsible development in East Africa and beyond. To create a model for sustainable, carbon neutral campuses, the master plan aims to provide energy-efficient, durable, and climate-appropriate buildings, landscapes, and infrastructure. In so doing, it will also demonstrate a means to address rural East Africa’s challenges related to poor construction standards, energy, and water and natural resource conservation. We have also worked with our design team to develop design guidelines to express our intentions for the design of buildings, open spaces, and landscapes that will occur on the Same Polytechnic Campus. 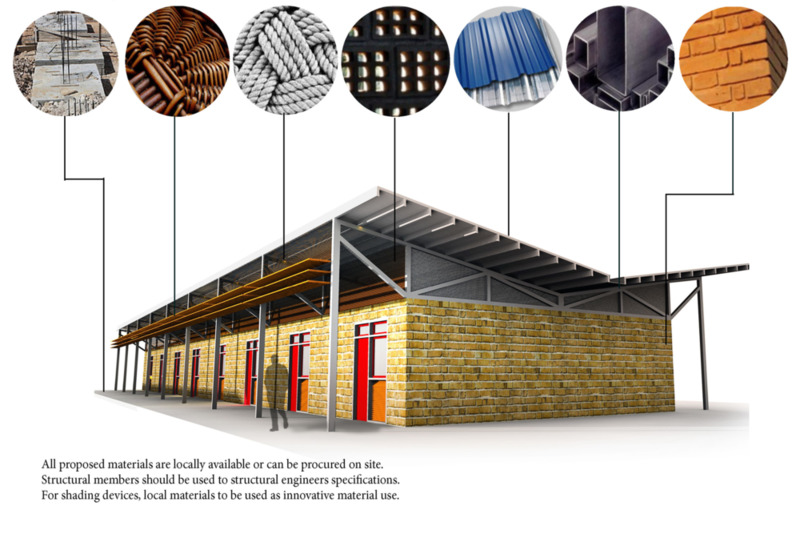 Building design guidelines will ensure a consistent architectural character and compliance with principles of sustainable planning and building design. In general, they do not prescribe a certain architectural style or specific design strategies. Instead, they are meant to establish a framework from which appropriate solutions are created for the design of each campus building. Landscape design guidelines address the design of campus landscape to ensure a consistent savanna character and compliance with principles of sustainable planning and environmental conservation. The current target for full enrollment at the Same Polytechnic College is 1,200 full-time equivalent students, with the capacity for 1,000 to live on the campus. The remainder will comprise local community members attending continuing education courses part-time. The college is not expected to be at full capacity when it first opens. The master plan therefore separates the development of campus facilities into five phases, with the resident student capacity at the completion of each phase indicated in the table above. In the first development phase, the site will be secured and prepared for construction to begin. This will include clearing vegetation from certain areas of the site, erecting fencing, installing boreholes for water, and building temporary offices and staff housing. Preliminary activities for several of our development and outreach programs will begin on site during this phase including the Sustainable Agriculture, Forestry Management, and Eastern Arc Conservation programs. In the second phase, the first permanent campus facilities and infrastructure will open, accommodating up to 300 students in the School of Agriculture, Food and Environmental Sciences (SAFES) and the School of Building Science and Construction Technology (SBSCT). Building these two schools first was decided for strategic reasons. Students and faculty in the SAFES will be able to utilize unused land for agricultural activities until the campus is fully developed, creating a temporary additional revenue stream for the College. Similarly, students and faculty in the SBSCT will help construct new buildings in future phases of development. This will contribute towards hands-on learning experiences while also reducing construction costs. The fourth phase will expand the campus further to include the School of Tourism and Hospitality and the School of Social Studies and bring the student capacity to 900. The fifth and final phase will expand residential facilities to bring the campus to the full planned capacity of 1,200 students.